RUBYLEE PRODUCTIONS (Kimilee Bryant, Producer), in association with The Friends of Alverson Center Theatre, will present a special ‘preview’ of the new musical MIRACOLO at the National Arts Club, 15 Gramercy Park South, NYC, on Monday, January 27th at 2 PM. Admission to the one hour presentation is by invitation only. MIRACOLO, with an original book and lyrics by Jarlath Barsanti-Jacobs and music by Emilio Solla, will be directed by Gabriel Barre (Wild Party, Almost Maine and upcoming Amazing Grace). MIRACOLO, set in Italy in 1895, deals with a subject still relevant today - healthcare. If you got really sick who would you trust? The new musical is about two people trying to heal an ailing tycoon, using opposing methods. A surgeon (Roberto) and a miracle healer (Apollonia) fall deeply in love but the forces of big medicine interfere and all hell breaks loose at this heavenly spa. It’ll take a miracle to get these lovers back together. But then it’s Italy, where amore conquers all. Past readings have been at The Cincinnati Conservatory of Music and at Golden Fleece Ltd., (an award-winning organization in NYC that produces new works by emerging American composers) plus several developmental readings in NYC. 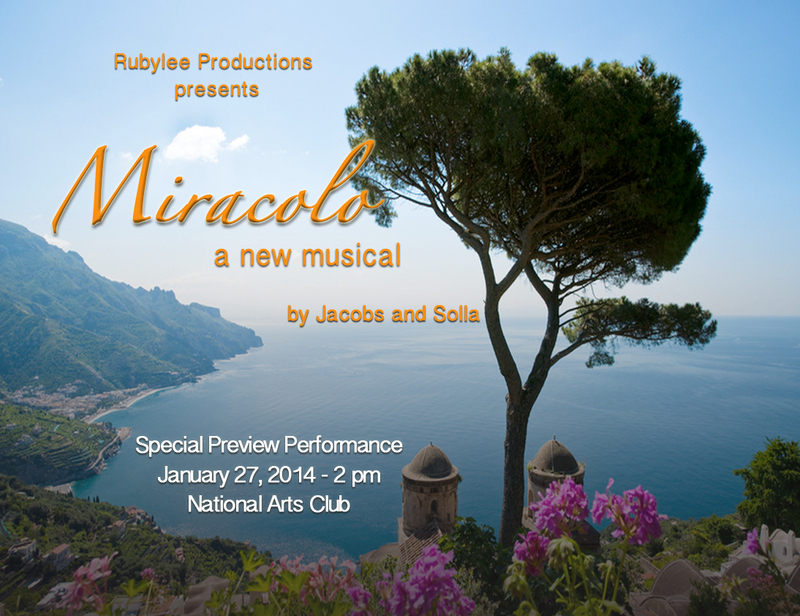 For more info on MIRACOLO visit www.miracolothemusical.com or call (212) 724-5282 or kimilee@kimileebryant.com.